Doctor Who: Revisiting SPEARHEAD FROM SPACE | Warped Factor - Words in the Key of Geek. Colour arrives in the world of Doctor Who as Tony Fyler looks back at Jon Pertwee's debut adventure, Spearhead From Space. It could so easily have ended. There in 1969, when the second Doctor was put on trial, it could so easily have ended. Perhaps the show could not have been brought down with just six words, but six sentences perhaps, re-written, could have seen the Doctor’s adventures brought to a halt, could have seen him return home to Gallifrey to save the lives of his friends, and that could have been that. Certainly, the mood at the time seems to have been that if Doctor Who was to survive into the 1970s, Things Had To Change. Perversely, it was the same challenge that had been laid down ahead of Patrick Troughton’s casting in the role – the show needed to change if it was to survive. It changed in 1966 and had wrung three more years out of the premise of a wandering errant knight in space and time, fighting evil and protecting the good. Six years was a good run for such a show. But different wisdom prevailed, and the show’s production team confirmed that if Things Had To Change, things would change. If any show could meet that mandate, it was Doctor Who. When it came back on January 3rd, 1970, “All Change!” was the order of the day. Radio comedian and film actor Jon Pertwee was the new Doctor – and a bigger contrast with Troughton would be hard to imagine – Troughton’s short, dark “clown” was replaced by a tall, lean man with a nose to break rocks with and a shock of white-blond hair. What’s more, to the handful of people in Britain who could afford a colour TV, Doctor Who was now available to view in all the colours of the rainbow. But by far the biggest change was in the format. The Tardis, the Narnian wardrobe to all of time and space, was to be grounded, and the Doctor, the ultimate rebel against authority, was to be stuck on Earth in the 70s (or 80s, depending on the dating protocol – but really so very much the 70s), as the scientific advisor to a special military unit. It was as risky a shift in the show’s paradigm as first introducing regeneration had been, and like that move, it could have killed the show stone dead in a quest to re-invent Doctor Who as an action-spy thriller along the lines of The Avengers or Danger Man. The unique selling point that would set the show apart from those rivals though were the aliens, so when the new Doctor was launched, there was its difference, right in the title: Spearhead FROM SPACE. Spearhead is a wonderful oddity – recorded entirely on film, it looks like little else in the show’s history, including the episodes that follow it and build on its premise. And with so many debut elements to cram in, it’s a wonder it works at all, let alone as well as it does. New Doctor, new premise, new companion, new production ethos – and that’s before we even come to the story, and the invention of one of Robert Holmes’ finest, creepiest ideas. It’s 1970, the beginning of the march towards disposable culture, and that means plastic. How deliciously sick do you have to be to tap into that relatively new feature of everyday life and make it the stuff of nightmares for forty years and counting? Robert Holmes genius-sick, that’s how sick. The Autons are, in terms of the fundamental philosophy behind their creation and the reason they scare the audience, right up there with the Daleks and the Cybermen. The Daleks are what you get if you teach eight-year-olds to hate and then lock them in the dark and give them a ray gun. The Cybermen are what you get if you’re so scared of dying you forget how to live. The Autons are what you get if you turn your society over to uniformity of aspiration in the service of commerce. They are the shop dummies from hell, and they’re coming to get you. 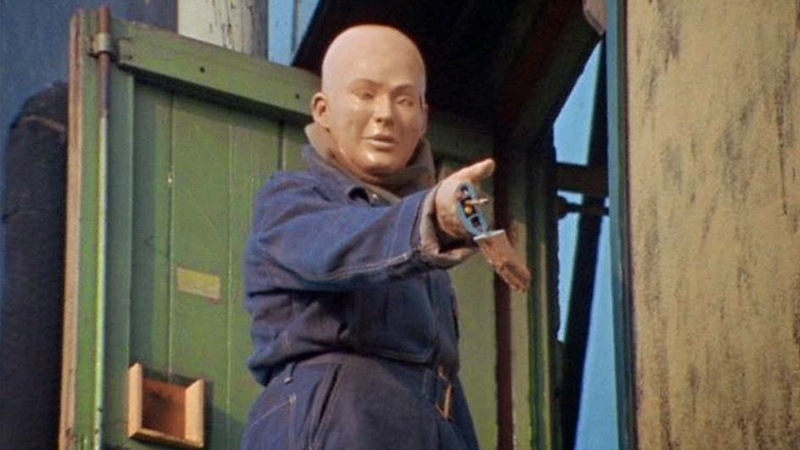 As a way of responding to those in the BBC who thought Doctor Who couldn’t adapt to the new world, the Autons were also a great big plastic one-fingered salute. The story shows Jon Pertwee’s new Doctor off to great advantage – Patrick Troughton would have phenagled and gibbered his way out of hospital; Jon Pertwee has a wheelchair chase! While unconscious for much of the first episode, he’s already the focus of one strand of the story, while the shenanigans at the plastics factory ably deliver the creeps, without shooting the bolt of their scares too soon. In that regard, Spearhead is a debut of two halves, the first two episodes setting up the mystery of the Doctor and something creepy and plastic – we see an active Auton first in the forest, and it’s so incongruous there, with its empty eyes, that it takes the breath away, and when it begins to move through the woods, it’s unnervingly flexible and human. Somehow, when something looks like a shop window dummy, you expect it to have jerky movements, but it feels like this thing could hunt you down on foot and kill you without a thought. Really though, the bulk of the plastic menace for the first two episodes is delivered by the imperious and very alien Channing, who acts (to dip into another fandom for a second) as Locutus of the Nestene, speaking about humanity dispassionately as something to be destroyed (‘Total destruction’) like thousands of other species before it. When the Doctor recovers from his regeneration though and starts firing on all cylinders, so does the story – the idea at the end of episode two that the thing we saw hunting in the woods has been manufactured on a production line, as it delicately ballet-hops its way off the line and behind the hapless Ransome is massively creepy. The notion of a leading general being replaced by a plastic ‘android’ is a simple and effective gateway into the central idea: so many people in politics, in the army, in business, do things that seem antithetical to the general good…perhaps it’s deliberate. Perhaps they’re not fully human at all. Perhaps they’ve been replaced. It’s a solid bodysnatching chiller, and the end of episode three, when General Scoby comes face to face with his duplicate on his own doorstep, is a surreal framing of the idea. Episode four picks up the pace significantly, with that scene – the one that everybody remembers. Shop window dummies jerking and spasming to life, breaking free of their displays, and with 70s hair and clothing, gunning down shoppers in the street. The odd thing about that scene is not that it scares the bejesus out of a nation of children, but that in storytelling terms it’s utterly random. 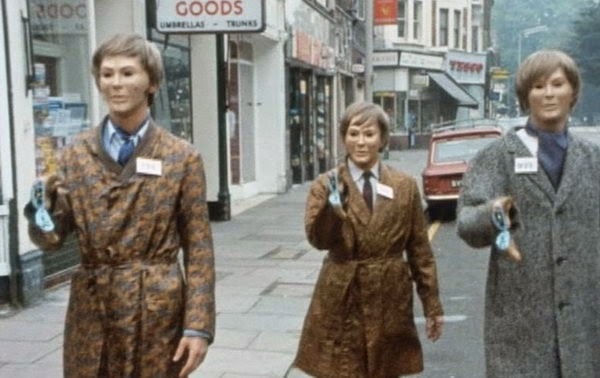 Why should the Autons announce their presence by going on a killing spree of shoppers? What do they gain by it? Absolutely nothing, which seems to suggest it’s there for its allegorical value - the shoppers pay the price of the consumer culture that would let the Autons destroy the whole of humanity. They die for us, as surrogates of our casual consumption and waste of the world’s resources (perversely, we’re more biodegradable than the Autons are), and our addiction to commerce. Or maybe, just possibly, Robert Holmes really hated going shopping on a Saturday afternoon. That scene is possibly the newest thing about New Who in 1970. The seemingly random slaughter of innocents, the horror of the everyday made frightening, and the fact that when it happens, the Doctor’s nowhere to be seen, not just minutes away from stopping them. That’s why it’s remained burned into the memory of those who watched it over the decades since. If the challenge for Doctor Who in 1970 was to change or die, to find a reason to exist in the TV schedules of the nation, Robert Holmes, the shop dummy scene and Spearhead From Space gave it its new mission statement: We scare the pants off children. We bring the horrors of time and space to a high street near you, so you are now in danger. That’s what we do now, and you will love us for it. More than forty years on, the mission statement of Spearhead From Space is still in effect. The show is still scaring us with the ordinary given a lethal twist – statues, shadows, dolls, wifi – and children of all ages are still running with the Doctor to keep them safe.